How Hard is it to Learn to Play the Guitar? The quick answer to this question is “it’s pretty easy,” IF you have the right instructor or instructional materials (ie books or videos). After teaching guitar since 1962, I’ve had a wide variety of students walk through the door. The vast majority have learned to play and, as far as I know, have kept playing for years. The small number of people who didn’t get cozy with the guitar probably were missing one essential ingredient: determination. If you really want to play the guitar, neither hell nor high water can stop you. As I indicated above, your success at learning the guitar will depend on the quality of the instructor or instructional materials to choose to learn from. The first thing I would do is to figure out what your learning style is. For instance, if you’ve always loved music and have been successful at playing by ear on another musical instrument, then learning the guitar will be relatively easy. If guitar is your first instrument and you’re either a young child or a senior citizen, then perhaps a patient instructor would be beneficial. And if you’re somewhere in the middle of these two groups, you have a variety of options. Instructors: Your neighborhood music store is a great place to look for a guitar instructor. Be sure to ask for an instructor who is experienced working with beginners. It is important to be clear about what kind of music you want to play on the guitar. Is the instructor adept at teaching the style you want to learn to beginners? Books: I recently was shocked to learn that there are over 1000 beginning guitar books for sale on Amazon. Which one to choose? Good question! I recently teamed up with a seasoned guitar teacher named Ted Parrish to write a book called Painless Guitar – A Fun & Easy Guide for the Complete Beginner. Together, we have been teaching guitar for a combined total of over seventy years. We made every effort to make this book as easy, fun and user-friendly as humanly possible. This low-priced book ($9.95) covers all the basics in a clear, relaxed and humorous way. It has easy to read chord charts, as well as tab (guitar music) to 31 folk, bluegrass, blues and gospel classic songs. The book comes with a link to download online audio so you can hear what everything sounds like. One last thing: The main reason to get a great instructor or quality book is so you won’t develop bad habits that will impede your playing and stick to you like glue. 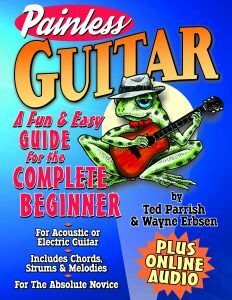 For more information and/or to order Painless Guitar – A Fun & Easy Guide for the Complete Beginner, click the title of the book, visit https://nativeground.com/product/painless_guitar/or call (800) 752-2656. Thanks for the advice for learning to play the guitar. It makes sense that the quality of the instructor we find will be indicative of my son’s success. He wants to try and learn, so I’ll start looking for the best teacher we can find.